In this article Dr Timothy Chevassut, Consultant Haematologist at the Royal Sussex County Hospital, Brighton, looks at the benefits of Vitamin C in the treatment of MDS. Not many people will have heard of Linus Pauling but he remains one of the greatest scientists of the 20th century. His early work was on the haemoglobin molecule, something that is of great importance to our understanding of anaemia and the symptoms of tiredness that many patients with myelodysplasia (MDS) will know all too well. However, it was his deep held belief in vitamin C and its health benefits that Linus Pauling will be remembered for, particularly in preventing and treating cancer. At the time, not many people believed him, thinking that his claims for vitamin C were unfounded, but it turns out that Linus may have been right all along, at least in the case of the MDS. Recent research has shown that vitamin C, or ascorbic acid, as it is known scientifically, can have profound effects on the blood. This is because vitamin C can affect the way that some proteins work in our blood cells. In particular, there is a protein called TET2 that carries out an important job in our bone marrow by controlling a process called DNA methylation. This is the mechanism that tells genes when to switch on and when to switch off. In turn, this determines what type of blood cells are produced, a process called differentiation. In MDS, the fundamental problem is that cells fail to differentiate properly and very often this is due to a mutation in the TET2 gene that causes DNA methylation to go awry. Remarkably, it turns out that vitamin C can help to correct this problem by binding to the TET2 protein and boosting its activity and thereby restoring normal DNA methylation! This is because vitamin C is a what’s called a ‘co-factor’ of the TET2 enzyme that is required for it to work properly: a discovery made only a few years ago by scientists working on DNA methylation. In MDS, doctors use drugs such as azacytidine to help restore normal DNA methylation in the blood cells in order to treat anaemia and improve low cell counts. Azacytidine slows down progression of MDS to acute myeloid leukaemia (AML) and can even target the leukaemia cells themselves. 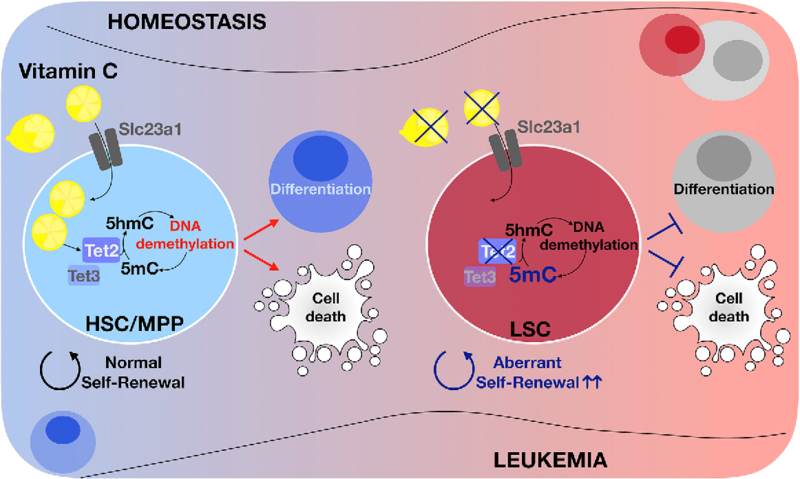 In laboratory experiments, vitamin C can overcome the mutated TET2 protein and help to kill the leukaemic blasts in combination with azacytidine. This exciting discovery has led to the testing of vitamin C in patients with MDS to see if it can improve current treatment with azacytidine. There is certainly evidence to suggest that vitamin C can enhance the effects of azacytidine but we don’t know yet whether this will work similarly in MDS patients. Nor do we know the dose of vitamin C that patients would need to take or even whether vitamin C is at all harmful at higher doses. That is why several clinical trials, both in Europe and the USA, are now looking at whether vitamin C can be a useful treatment in MDS. First of all we have to establish that vitamin C is safe for patients and does not have unwanted side-effects. Once we have found out the best dose, then there will be further clinical trials to explore whether it actually works to improve patients’ symptoms and prolong their lives. Hopefully, this is something we shall be looking at in the UK in the near future. Oranges and lemons...Should patients diagnosed with MDS start taking vitamin C? It is probably too early to say at this stage but it is certainly worth bearing in mind the many other health benefits of eating fruit, particularly citrus fruits such as oranges and lemons, as part of a well-balanced diet. Perhaps we should all be listening to the good advice of the bells of St Clement’s? This article was first published in the 9th Edition of the MDS UK Newsletter. If you haven't received it, please contact us.